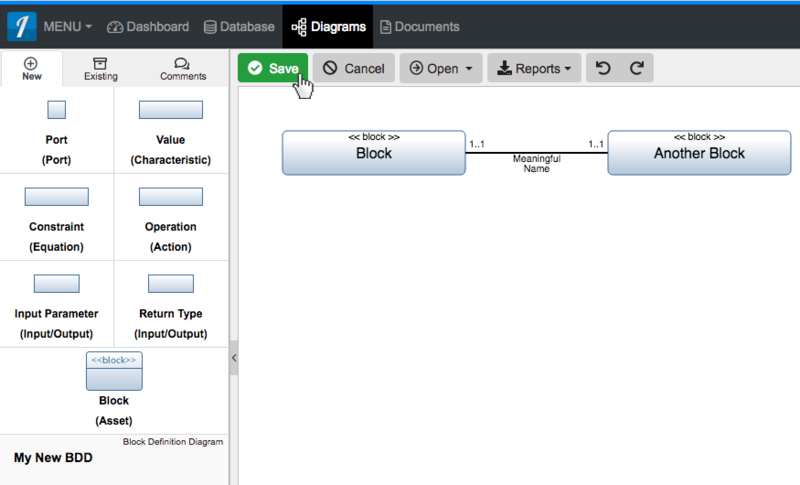 Within a 'Block Definition Diagram,' select the 'Block' you would like connected to another 'Block'. When the parent 'Block' box highlights green, release the left mouse button over the 'Simple Association (connected by)' section to drop the new 'Logical Connection' and add it to the diagram. Within a ‘Block Definition Diagram,’ select the ‘Block’ you would like connected to another ‘Block’. When the parent ‘Block’ box highlights green, release the left mouse button over the ‘Simple Association (connected by)’ section to drop the new ‘Logical Connection’ and add it to the diagram.